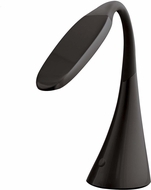 Office Chairs Unlimited has a large selection of adjustable office desk lamps and reading lamps at discount prices. Adjustable desk lamps are a perfect fit for college dorm rooms, office desks, or a workbench to get the job done. Interactive lighting provided by desk lamps is aimed at giving you the perfect light source for the task at hand. All of our adjustable desk lamps and table lamps are at discount price with free shipping included. Shop Office Chairs Unlimited and save big.